WILLEMSTAD – The soon to be largest shopping mall on the island is experiencing more delays. According to the Venezuelan Group, Constructora SAMBIL, the current official opening schedule is set for October of this year. 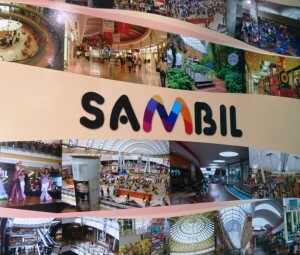 SAMBIL Curaçao shopping mall is the newest and largest extended-hour shopping complex located in the Veeris area. According to the Director of Constructora SAMBIL, Alfredo Cohen, SAMBIL Curaçao strives to offer a great variation of several well-known retailers, restaurants and activities for the entertainment of tourists and locals, all within a comfortable and secure shopping environment. The shopping mall is located between Weg Naar Westpunt and Rector Zwijssenstraat, only a few minutes’ drive from the capital city and the local airport. 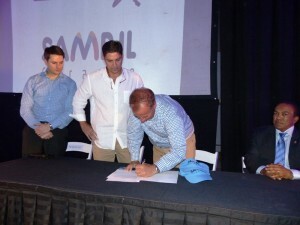 The Minister of Economic Development, Mr. Stanley Palm officially opened the SAMBIL sales office. This office is now located in the mall. In addition, Mr. Cohen signed a contract with Cinemark. Cinemark USA, Inc. is a chain of movie theatres owned by Cinemark Holdings, Inc. operating in North and South America, and Taiwan. It is headquartered in Plano, Texas. As of December 31, 2013, the Cinemark circuit is the third largest in the United States with 334 theatres and 4,457 screens in 40 states.It is the most geographically diverse circuit in Latin America with 148 theatres and 1,106 screens in 12 countries;it is the largest movie theatre chain in Braziland the fourth-largest circuit in Mexico. Cinemark also holds the spot of second largest circuit internationally. The movie theater will have six screens in Curacao. Three of them will only show 3D movies.